Whether an OEM or a supplier, a company’s core business needs to be the focus of the entire enterprise. The last things automotive companies need to worry about are side issues—for example, if the air conditioning is on the fritz, the copier needs new toner, or the trash cans need emptying. That’s where Hopkins Advantage comes in. Specializing on providing a variety of services to the manufacturing industry, the company occupies an unusual place in the automotive supply chain. It is one of those rarities in the industry, a certified Women’s Business Enterprise (WBE) and Woman-Owned Small Business (WOSB). 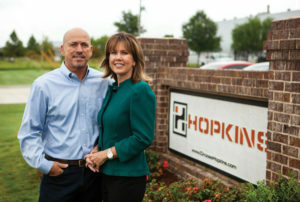 Kelly and Marty Hopkins, co-owners, run the company, which developed from their work together owning a construction company in 2012. The company’s growth was largely due to word of mouth. When Hopkins went to work for a facility in Mississippi, often those businesses had operations in other states where they wanted the same caliber of services. Soon, Hopkins had clients in Tennessee, Alabama and Georgia, simply from expanding into the larger organizations of facilities they served locally. Automotive was a natural fit for Marty Hopkins, who spent more than 20 years in facility services in the automotive industry. Those were relationship-building decades, creating connections with manufacturers such as Nissan, Kia and Honda. Kelly Hopkins’s background in property management has taught her to bring together disparate elements and ensure they run smoothly. The company specializes in rack wash and repair, storeroom and inventory management, preventive maintenance programs and maintenance of mechanical systems and industrial systems. Over time the Hopkinses recognized other needs, including access control and parking lot management and janitorial services and grounds maintenance. These days, it’s a “you name it, they do it” attitude that keeps them poised for future expansion. Marty Hopkins is vice president of the board of directors of the Mississippi Automotive Manufacturers Association, giving him a chance to network, and an opportunity to see the future of automotive in the state firsthand. The Hopkinses do not want to be categorized as a temp service. They’re in it for the long haul, which Kelly Hopkins says is the most benefit for the companies they serve. “When we manage a process completely, like recycling for instance, you no longer have to worry about that work,” Kelly Hopkins says, adding that “We can handle anything that doesn’t deal with the production of the car. Along with building a reliable workforce, Kelly Hopkins says it’s a hands-on approach that contributes to the company’s success, though it often takes the couple on the road in different directions. Marty Hopkins says those visits to warehouses and plants throughout the Southeast are essential, not only to meet with managers, but to find out if there are other areas for the company to step into, allowing the client to focus on maximum productivity. Through indirect labor, Marty Hopkins says their company not only helps the clients save money, but also might catch some tasks that need to be done that can slip through the cracks in a busy workplace. Consider one example where costs can be cut: rack marshaling. With multiple sizes and configurations of racks making their way from one producer to the next for use in automotive Hopkins saw an opportunity. When OEMs return racks to suppliers, the maintenance is straightforward, but time consuming. Hopkins Advantage examines the rack for damages, repairs it if necessary, sorts it according to size and usage, and returns it to service to begin the process over again.